The Orpharion was mainly a late 16th and early 17th century phenomenon. The name is a conflation of the famous Greek musical heroes, Orpheus and Arion. 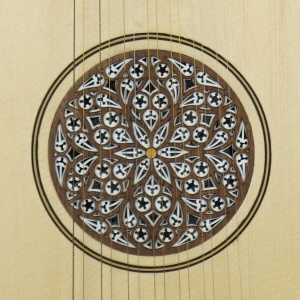 It has a suitably ethereal, resonant sound, and was a popular alternative to the lute. 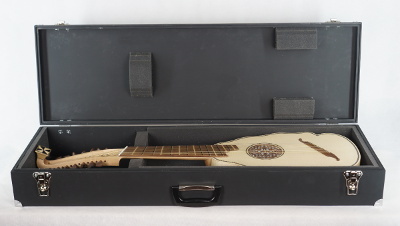 As far as we know, only William Barley published music specifically for it, but since it was tuned exactly like a lute, all the vast lute repertoire of that prolific period was (and is) accessible. This instrument is based on an original by Francis Palmer, made in London in 1617, now in the Musikhistorisk Museum, Copenhagen, Denmark. The Palmer instrument has 9 courses, but I reduced that to 7, mainly to simplify construction and keep the price down. The other well-known surviving orpharion, by John Rose, has 6 courses. The strings are a combination of brass and iron. That's what gives it its other-worldly tone. 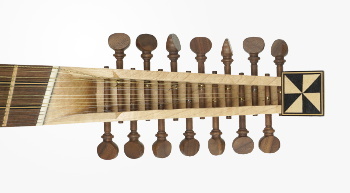 16th century metallurgy had problems with getting sufficient range without strings breaking, so the orpharion resorts to the ingenious device of sloping the bridge and nut (and all the frets to correspond), to make the bass strings substantially longer than the trebles. Even then, there is some evidence that it relied on a super-strong and secret wire developed by Jobst Meuler in Nurnberg. That hypothesis is disputed, though. It may be that the Palmer orpharion was simply at a much lower pitch than the G that's generally assumed. In any case, an orpharion nowadays has to be able to operate with a top string at modern pitch G. Luckily, we now have steel strings which are quite happy and robust at that pitch, while retaining Palmer's original scale length. They work very well, and the sound is not drastically affected. “Home again, market is done” from Margaret Board's Lute Book, c. 1620. Untitled piece from William Mure of Rowallan's Lute Book, c. 1620. More courses, different head - please enquire.